Channel your invincible Norse warrior spirit and set sail on seafaring expeditions to pillage and plunder in classic Viking style in Arctic Fortune. The game captures the fierce and stoic quest of this hearty breed from the past and the design is portrayed in a striking graphic style that truly creates the ambience of the history and sagas of these northern tribes. This video slot offers 1024 ways to win on the 5 reel game. Coin sizes are .01, .02, .05 and .10 and are multiplied by up to 50x the line bet for a win payout. You can win jackpots of 1,500 or 1,000 coins and, with high multipliers in the bonus game, you can cash in on big rewards. The backdrop is the frigid north, dripping with frosty icicles. The reel symbols are beautifully depicted in animated illustrations of Norse warriors, an arctic wolf, a brimming horn of plenty, a longboat, and a treasure chest. A war songs pounds a foreboding beat in the background, calling Viking men and women alike to battle. 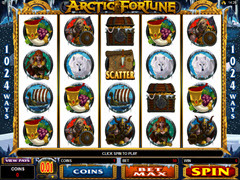 The scatter is depicted by a scrolled, ancient map and the wild, which only appears on the 2nd or 4th reel, is the Arctic Fortune logo, substituting all other symbols but the scatter. 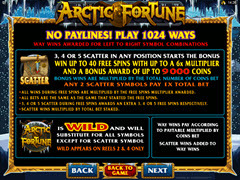 The scatter pays an award equivalent to the bet if 2 appear on the reels and if 3, 4 or 5 show up, up to 40 free spins can be activated with a multiplier as high as 6. Expert mode is available with an auto play feature. The bonus game brings you to a dark gate embossed with a spider and the archer must aim arrows at the dropping spiders to open the gate. Once the gate opens, the player is confronted by a gargantuan black widow, edging toward him as he again tries to fling arrows to target the monstrous arachnid’s head and body. Hit both the door cranks and the iron door then crashes upon the spider to kill it. Throughout these rounds, you are awarded free spins, multipliers and coins for every hit you make before returning to regular play. While the game is artistically created and the 1024 ways to win implies that there are many chances to win, it’s sometimes tricky to understand how the reel combinations payout. That being said, the bonus game is great fun and can hook you into continuing to play in anticipation of another round.